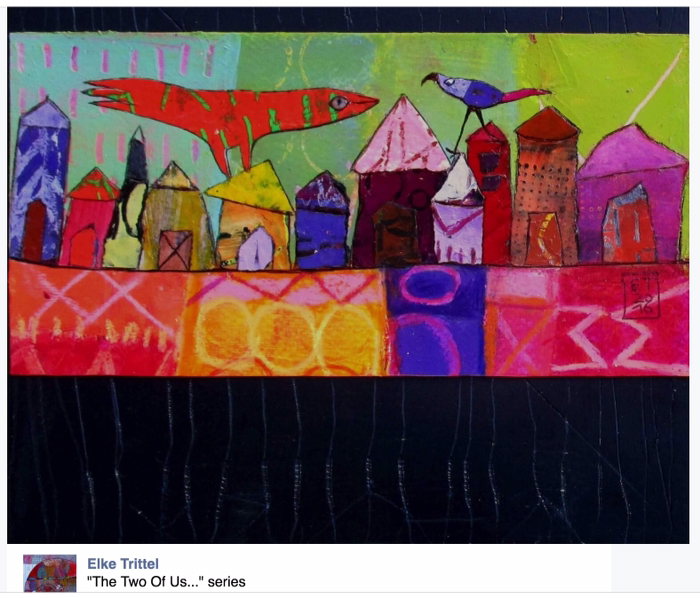 Far from the big cities and traffic jams , deeply in contact with nature, there is a painter, and her name is Elke Trittel. She became famous, thanks to a 365 days painting marathon . Each of her art pieces has a new character. Her visionary world is an independent and parallel universe populated by fanciful animals, unusual faces and gigantic flowers. The artist depicts her figures with great humor, giving them a complete life. She appears to bring them to life so they can come out to play. Some of her paintings are sculpted using “fibrite” , a kind of interior wall paste that she can model easily. She paints the surfaces afterwards with acrylic paint. She also uses material such as wires , clay, fabric and recycled objects, combining them all together according to her needs. Born in Wolfsburg, Germany, Elke now lives and works in Narbonne, France. She studied at the University of Goettingen. Thanks to the website: artdelafibrite. canalblog.com for the above information.